How Do You Pronounce 'Duvel'? 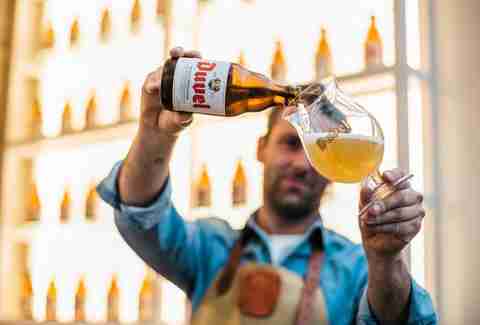 One of the most popular beers in the world is Duvel -- a strong pale ale exported by Belgium, just like chocolate and Van Damme. But unlike Jean Claude's name, which is fairly easy to say, Duvel's a little trickier. How the hell do you say it? Duh-vill? Doo-vell? Doo-vill? We got to the bottom of the mystery. 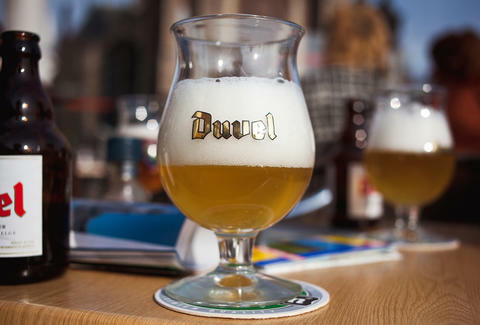 Fun fact about Duvel: While it's a Belgian company, it also owns a few fantastic US-based breweries like Brewery Ommegang, Firestone Walker, and Boulevard. And since it has offices in the US, we reached out to the brewery stateside to learn how to say Duvel once and for all. But wait, we're not done! While that's a perfectly fine way to pronounce the beer's name if you're in the US, if you go to Belgium and order one, consider saying it this way: "DOO-vill." Here, listen to a Duvel guide in Belgium pronounce the name of the beer. It's a little disappointing that the answer is both, isn't it? But the solution on how to pronounce the beer is not that difficult. If you're in the US, you order a DOO-vell. If you're in Belgium, ask for a DOO-vill. And if you're anywhere else, select one pronunciation and hope for the best! Lee Breslouer is a senior writer for Thrillist, and will have a pint of DOO-vill. Follow him to beer @LeeBreslouer.